On August 11, two young women walked from one side of Moscow to the other carrying a giant iron tube. RBTH has collected photos of this art performance from social media. 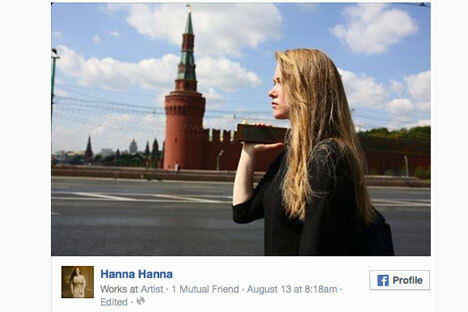 Hanna Zubkova and Ekaterina Vasilyeva enacted a mammoth 17-hour art performance in Moscow on August 11. Under the title of "Revolutionary Axis", the two women carried a giant iron tube weighing 30 lbs across the whole Russian capital, starting their journey from the northernmost point of the Moscow Ring Road at 5:30, when the sun rose. The title of the performance was carefully chosen for its ambiguity, allowing it to be interpreted as the axis of rotation or as the axis of revolution. The goal was to reach Revolution Square when the sun would be at its zenith, after which they continued to the southernmost point of the Moscow Ring Road. In fact they executed a straight line perpendicular to the projection of how the sun moves from east to west. During the walk across the capital, Zubkova and Vasilieva took selfies and uploaded them onto Facebook, and were photographed by onlookers.